It’s not super common for us to take on projects that market a single person. It takes a different skill set – one that highlights the personality and talents of an individual over a collective brand. Elise Rooker is Aberdeen born and East-Coast educated. She’s an actress and television host looking to expand her career in New York City. She lives in New York where we travelled to stage multiple photo shoots. 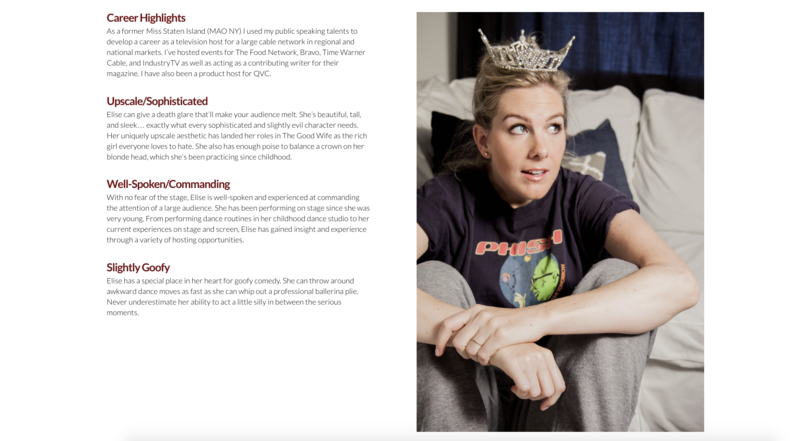 From eating her favorite foods to formal head shots to crown-wearing, we snapped images of Elise that highlight many different facets of her personality. Every member of alder|creative is in love with photography. The work we did for Elise accentuated this aspect of our service and helped us recognize the market for business-based photography. It’s something that we hope to incorporate into every web project. The photos were our starting point for Elise’s website. They helped give us direction and are the focal point of the pages. Elise’s old website was cluttered and outdated, making it difficult for people to find information. The one we built is streamlined, with only a basic number of pages that contain pertinent information. Elise needed someone who would listen to her needs and bring out her personality as well as her Pacific Northwest roots. More than just provide Elise with a product, we attempted to bring education to the table as well. We gave Elise tips on managing her social media accounts which she has implemented with success. We are pleased that Elise is happy with her product and that we were able to help her move on to the next phase of marketing herself. Alder|creative is much more than a web building service. We attempt to bring education, skills, and continuing service to each experience. We are passionate about helping businesses and people stand out so that they can be successful.